This week I'm in San Diego for Cisco Live US 2012. It's been an amazing week. Even on last Saturday I had to fly 17 hours to reach Los Angeles from Dubai. Even then I had to continue driving 200 miles to reach San Diego. Even I didn't sleep at all during the flight, and I was able to sleep only 3 hours before my session. Even I had to deliver the 9-hour techtorial on the very first day of Cisco Live, together with the CCIE Program Manager and an expert from TAC team. Even I was completely dead and slept whole day after the session. Other than my session, the inspiring keynote speech and demo by the CEO, all other great sessions for full week, Cisco store and all the parties at nights, I also had chances to meet many great guys. From book author to distinguished engineers. From customers in US and abroad, to one great guy who invented label switched multicast. Two guys I met who reminded me to my past, because I used their book and guidance to become CCIE, are: Bruce Caslow, and Brian Dennis. Caslow is the author of the first CCIE book I read in 1999: Bridges, Routers, and Switches for CCIEs. Brian Dennis is the CEO and instructor from INE whom his video-on-demand and workbook I used to pass my third CCIE track. There are many great guys I met in Cisco Live San Diego, but those two are special because they reminded me about the good old days, or the hard days, when I was trying to pass the CCIE lab. It would be complete if Halabi and Doyle came to the event too, but I guess that would never happen. Meeting people from the past brought up some spark to my mind: how if I take one more certification, for the last time? - I work as solutions architect for Cisco Advanced Services. I'm a tech lead in the project with Cisco customers. I do design. I always do. And I do many more than what CCDE can test in the exam: meeting real customer, capturing real customer requirements, leading design workshop, managing resources, discussing and listening, writing design document, and many other design related tasks. And I have already 3 CCIEs, I work for Cisco and I have about 13 years experience working in the same field. I don't think I need to get certified as a network design expert. - CCDE exam test the knowledge in high level design. No low level design task. No product specific. No hardware architecture. I do low level design for real customers. I work with the details from physical link, IP addressing to low level configuration of IGP, MPLS, BGP, customer services, multicast, QoS, security and management, to migration strategy. I use best practices and the result from lab simulation and testing. I'm not sure if someone who works in low level design and such detail needs to get certified in high level design knowledge. - As mentioned previously, I have two lives. I work for Cisco in the day, and I run my non-profit organization at night. Or probably the other way around :) But in short, I'm always busy. I travel from time to time. I also have a family I need to spend my time with, as well as all other activities like offroading on the desert or snowboarding in Ski Dubai. Every certification requires the most expensive investment we have to make: time. Time that may better be spent to do something else. As you can see I can come up with many reasons not to take CCDE. And yet I can only come up with one reason to do it: because I'm a big fan of Cisco certification program. I call myself CCIE evangelist. I truly believe Cisco certification can help anyone to start or advance his/her career. I'm a living proof of this: everything I knew about computer networking at the beginning of my career, I had it because I followed Cisco certification. 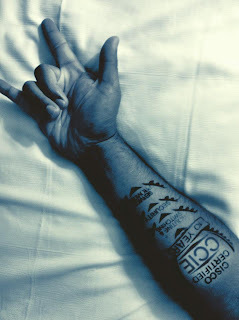 My cool tattoo, thanks to Cisco Live. Wondering if I can add another one next year. Nice point Himawan and nice tatoo. I was in Cisco Live . I took a picture with Bruce and Brian. is this cisco advertisement method of making their CCIE ppl to praise its certificates??? I am in the network field, and I like my job, I like cisco product, but their way in managing the certification system, its merely business, it is to eat money from ppl buckets and eat more in the networking market share from other manufactures. Cisco product is the best, but their certification/exam method is the worst. Question>>> we have in our organization a CCIE engineer, who can’t distinguish different network cables or fiber cables? And more, he is very poor in troubleshooting skills? So, how he can pass the lab with his low skills? Hi himawan..i understand how u feel abt this..gone through something similar..although not at the CCIE level. I am one of the billion CCNAs who want to do an expert level cisco cert for the two main reasons..better pay n for the love of networking..i have a coupla questions which i wish to ask u. Its been quite some time since CCDE came in..it is the 5th highest paying cert now..just before CCIE..the problem though as u said..the syllabus leaves out implementation topics which i think r essential in having a solid understanding of networking..so which one should i take? Which takes me to my second question..i just started working in dubai..i did my schooling here n engineering in computers in india n worked for over n yr there in the analysis field..so all i have in networking xp is a 3 month internship in a SMO. I want to move back into networking for the love of it but was wondering if ppl will even consider a guy who has 2.5 yrs xp in another field(in 1 yr 3 months from now) nd is a ccie..i know ccie's get payed arnd 30-35k aed in uae..i dont expect that much obv..but how much do u think a ccie w/o xp in networking should get paid..analysis pays me well but a jump to networking might mean a fresh start..thank u for ur help n sorry for the long post.